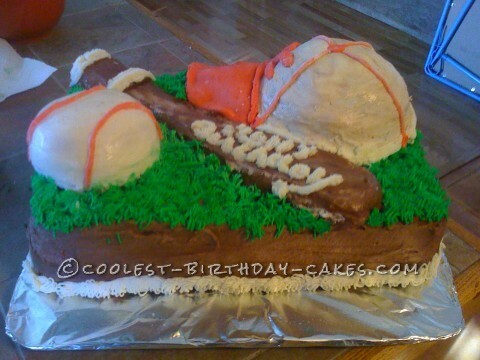 My son-in-law loves playing ball so I decided to make him a birthday cake that added a home run to his birthday! A lot of carving of cakes and planning went into this one. The sheet cake was chocolate and hat, bat, and ball was vanilla. The cake’s icing was also homemade with butter cream icing. I started with a sheet cake pan (18x12x2) ) cut in half and doubled. The hat was a cake pan used for making a filled cake. Half of the pan was used, a large cup-cake pan (for the ball) (rounded top for the ball (halved) and as for the bat, well a square pan was used and then carved and made into a bat. WHEW, lot of placing and carving but I enjoyed the results of making lots of smiles. I am sure that the memories of this day will not be forgotten for a long time. Now that ball season is upon us I am sure of making more of these for this year.